I’ve spent the last month debating with myself over which album would be the best one to launch Kids Rhythm and Rock. It was a really tough decision. With so much great music being produced every month how was I ever going to choose? So, I decided, why pick just one? How about three instead? Here are several of the nominees (one of which was the winner) for the 2016 Best Children’s Album Grammy Award. Their styles are completely different, but each album shines and belongs in every library collection. ¡Come Bien! Eat Right! performed by José-Luis Orozco. 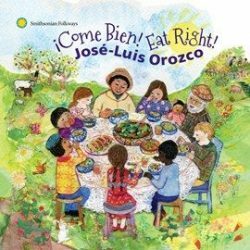 José-Luis Orozco, a bilingual educator and children’s author, has been writing and performing music for children for more than 40 years. His newest album, ¡Come Bien! Eat Right!, provides 19 bilingual songs on the general theme of healthy eating and nutrition. While many of the songs are educational, they are never didactic. The songs and chants are first performed in Spanish with the second half of the album featuring the English versions. Each song is upbeat and engaging. Topics range from the various kinds of milk to wholesome snacks and the importance of water. Some of the songs feature Latin dance styles, as in “The Fruit Conga,” in which colors and types of fruit are celebrated, and “The Dance of the Legumes,” which not only teaches listeners about the various kinds of beans but also gives step-by-step instructions for a cha-cha-cha. Many of the songs, including “Chocolate” and “Tortilla,” ask for audience participation either through call and response or clapping. Orozco’s charming voice is woven together with beautiful instrumentation that will delight and entertain children and parents alike. Whether you are a Spanish speaker or not, you will find yourself singing along with both versions of the songs. 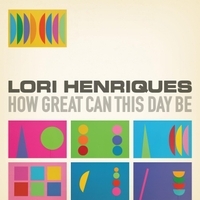 How Great Can This Day Be is a wonderful example of Lori Henriques’s continuing respect for a child’s ability to appreciate the rich, complex arrangements found in jazz music. Much of the original music on this album is built around a full jazz ensemble, with songs crossing from traditional jazz to Dixieland and cabaret and back again. The subjects range from parks where you can play and harvest edible greenery to how to express joy about the wonderful things in life. One of the highlights is the beautiful tribute to Jane Goodall in “Dream Jane Dream” which Henriques had the privilege of playing for Goodall herself, last fall. Although most of the songs are single voice, Henriques does include two duets. “Beau Paris” features her young son, who delightfully joins her in singing a variety of phrases in French and the charming ode to friendship, “I Am Your Friend,” on which she and her husband sing a sweet duet. Listeners will love the rich sounds of the moaning trombone, whispering flute and piano. Tim Kubart is a man of many talents. He’s the host of the Sprout Channel’s morning show, Sunny Side Up, the highly energetic Tambourine Guy for the amazing Postmodern Jukebox and a creator and performer of music for children. And, oh yes. The winner of the 2016 Best Children’s Album Grammy award. And the album that won that Grammy? 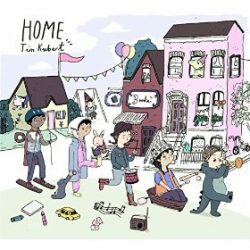 Home, Kubart’s second album for children. As with his debut, this album is filled with pop songs that will have listeners singing and, in some cases, dancing along. By writing the lyrics from the perspective of a child, Kubart and fellow songwriter Matt Puckett are able to capture the highs and lows of everyday life and convey them in a way that the target audience can relate to. The album is bookended by songs that look at the concept of home in very different ways. “Last Turn Home” emphasizes the fun of going away but recognizes the important feeling of home as the place where you belong. In contrast, the final song, “Moving Day,” shows a different perspective with the acknowledgment that home isn’t a physical place but rather wherever your family is. The songs in between cover topics such as the arrival of a new sibling, the wonders of creating art, the joy of “Dancing in the Kitchen” with your family, and, in “Better,” featuring Laurie Berkner, how much better it is to do things together with those you love. The infectious hooks and melodies will have you singing along in no time. For more about Tim Kubart, check out this interview from the June issue of School Library Journal. Welcome to Kids Rhythm and Rock! Welcome! My name is Veronica De Fazio. I started my career as a children’s librarian in public libraries in 1996. In 1998 I began reviewing audiovisual materials for School Library Journal. I reviewed books on tape (yes, they were all still on cassette then), videos which became DVDs and music. Over the years, the focus of the items that I reviewed slowly changed from a variety of formats to just children’s music. What originally was, almost exclusively, acoustic guitar led folk music, over the years slowly morphed into something that was so much more. It was pop. It was rock. It was alternative. It got new sub-genres, kindie rock/pop/etc. It had electric guitars, drums, brass, jazz piano. It had a reggae, funk, country beat. Children’s music became as rich as any offering for adults. And yet, it was still completely accessible to children. With the growth in the variety of children’s music came an explosion in new artists and albums. I know that as busy librarians, teachers or parents, you don’t have time to listen to every new release and that’s why I’m here. At least twice a week, I’ll be posting about new children’s albums and how they might best be enjoyed. I’ll also be sharing news from the land of children’s music and hopefully creating a place where we can share suggestions and ideas for using this new music in our early literacy and programming efforts. I look forward to jamming with you on this new musical adventure!